New Orleans The news is full of Occupy confusion. They are homesick for the encampments. Many of the big ones are going down. Los Angeles was evacuated with 1400 police from the LAPD and 300 arrests last night. Philly is down. There are a surprising number still up in places like New Orleans, Little Rock, and a host of other cities and towns. As interesting to me in some ways is the vitality that is still stirring in odd places and spaces, some of which have never been physical, but speak to an interesting and robust future, and that brings me to OccupyMarines. A friend sent me their way to have a look with the warning that this could be a real deal or something sketchier. My buddy, the outlier from a long line of generals in the army going back to the Battle of the Big Horn, and myself a veteran of many family gatherings and Thanksgivings where GS rankings and military slang from decades of service were an important foreign language to acquire, both thought the Occupy Marines site seemed to be authentic, especially when we took the long tour through a 20-minute YouTube interview with a Dutch reporter on the website. The action-plan, tactical drawings looked military all the way. In the leaderless, consensus system that so clearly characterizes Occupy around the world, the Occupy Marines contribution is an anomaly and a bit of a contradiction, since they avowedly offer to make their work in the movement based on their military training in logistics, supply, support, and “leadership.” For example one offering from them focused on winter camping and how to manage it, which might have been helpful to some of the longer rooted Occupy sites. 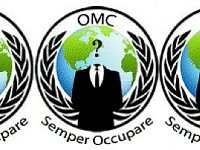 The Occupy Marines website seems to be under attack or some tension currently. Hitting a link brings up a warning about “unauthenticated certificates,” which may mean that there is trouble in Occupy uniform? There has been discussion from Occupy Marine about migrating to OMC to assuage the concerns of some of the more conservative leathernecks out there and about. Their Facebook site has 18,000 fans and is one of the more serious of such sites, and perhaps the easiest way to follow what they are up to. If something like this starts to grow, it creates not only capacity for the overall movement, but a series of new “fronts” in pushing for deeper and deeper social changes in hard to reach places and spaces. At the point Occupy is encamped firmly in everyone’s mind, victory is assured, and the rest is tactics and timing. This entry was posted in Protests and tagged Occupy marines, Occupy Movement by wade. Bookmark the permalink. PS – Don’t link to articles about yourself, it’s tacky.